Now who is the overachiever...hmmm???? LOL! Love them both but I think the first one is my favourite because of the colours and the glitter...my glitter arrives on Monday...yippee! Then I will be channeling my inner "Rita"...and yes, I need that snowflake die....oh boy! They are both very beautiful Rita! 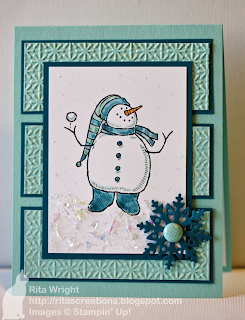 I love the colours you've used for the snowman card. But the Dasher, well it's absolutely STUNNING!!! Oh dear, I can't choose! They are both wonderful! I just had BOTH of these stamps out for my upcoming Christmas card stamp camp....so you know I love them both! Dasher is quite debonair in black, though...I have to admit! Rita, I can't choose either. They are both fabulous for very different reasons. Dasher is dramatic and the snowman is darling... so...love them both! I love them both... The Snowman Colors are great for winter! The reindeer card is stunning. Rita, these are both great, but the snowman is my favorite! I love the colors and the mica additions. I bet this is just gorgeous IRL! Thanks so much for sitting in this week! Ohhhh Sassy Stamper Gal you made two fabulous holiday cards! Beautifully done! 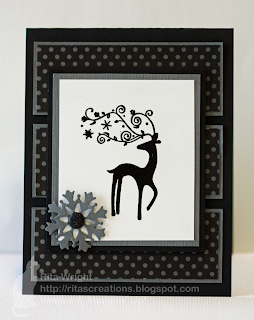 Absolutely love your "Dasher" card. Very sharp! I come to comment on a fantastic card - and find two fantastic cards with the same sketch. I love them both - The black one is so stunning, but the snowman is so gosh-darn cute! Both of these cards are beautiful, but the Dasher card is my favorite. The colors are fabulous, and not what you would think for a Christmas card, but it all works beautifully! Great job! Dasher is just stunning! My eye immediately goes to that one. 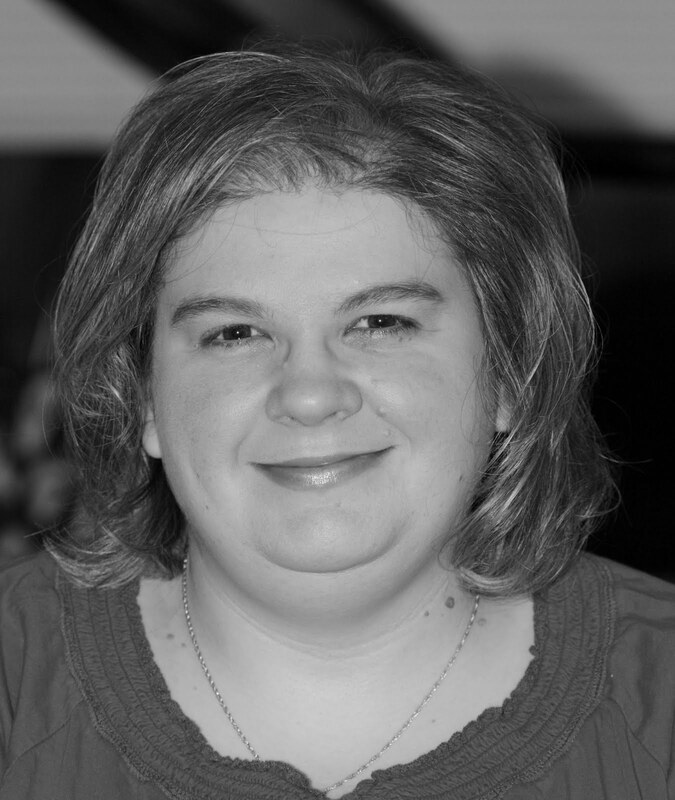 Love them both, but I am in love with your dasher one. Love the modern look, and color choices!!!! I love that dasher card. The black is stunning. Well done. I love both cards! 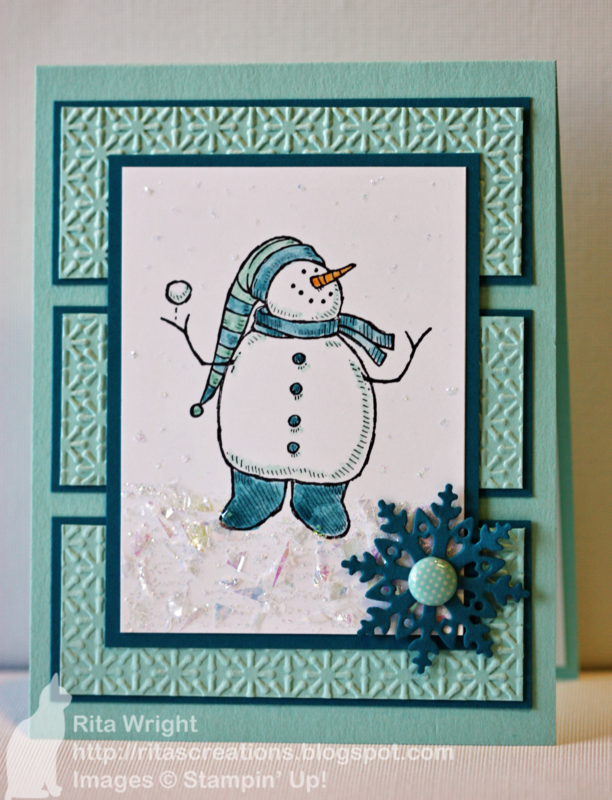 I know how you feel about the sketch it keeps on giving:) I am a sucker for snowmen so I love that card, but the dasher card is so striking with the monochromatic color scheme. Great job on both. Both cards are fabulous in their own ways! I can't pick a favorite! I love the cuteness of the snowman, and the elegance of Dasher! You outdid yourself, Sassy-Rita!